Officials broke ground Monday morning on the new commercial passenger terminal at Everett’s Paine Field. The developer, Propeller Airports, released new architectural renderings of the planned building. 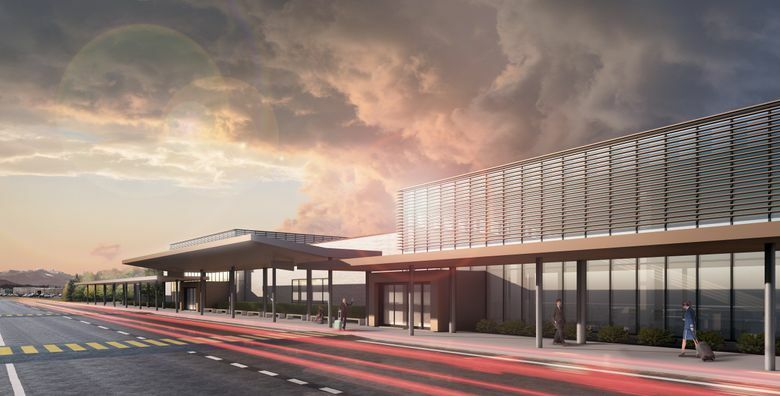 Officials broke ground Monday morning to begin construction of the new commercial passenger terminal at Everett’s Paine Field. Propeller Airports, which is owned by New York-based private equity firm Propeller Investments and is developing and will operate the terminal, released new architectural renderings of the planned terminal that replace the former proposal of a lodge-like design, using lots of wood and stone, with a boxier shape more like a typical office building. Alaska Air Group last month was the first to announce that it will operate a commercial passenger service out of the airport, with flights beginning in fall 2018 and tickets going on sale early next year. 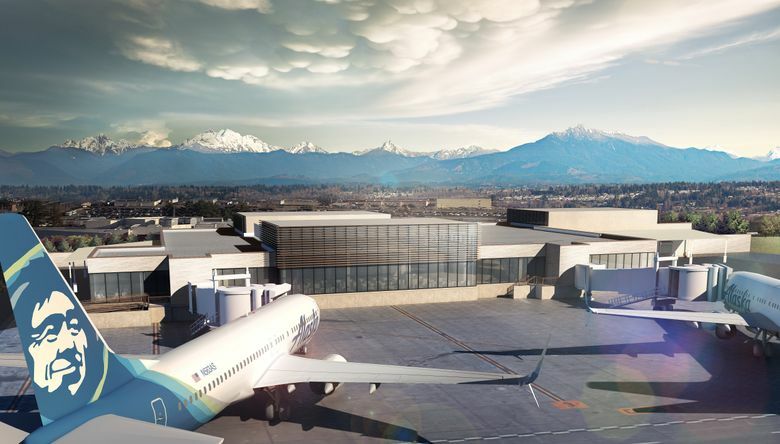 Alaska Air Chief Executive Brad Tilden attended the groundbreaking, along with the airline’s executive vice president and chief commercial officer, Andrew Harrison. Lt. Gov. Cyrus Habib, Everett Mayor Ray Stephanson and Snohomish County Executive Dave Somers also attended, along with various local elected officials and representatives of the Federal Aviation Administration (FAA). Propeller will lease the terminal for an initial 30 years, paying the county about $430,000 per year plus a share of the revenues: 2.5 percent for the first five years and 5 percent thereafter. The new terminal will have just two airport gates. With typical turn times, that means the peak capacity of the airport will be roughly 16 flights per day, or 32 takeoffs and landings. Alaska said it plans to operate nine daily departures from the airport to destinations along the West Coast from Oregon to California. According to data provided by Paine Field, airport traffic in 2016 included an average of 7.6 takeoffs or landings per day by Boeing aircraft or by the Dreamlifter jets that bring in large pieces of the 787 Dreamliner. Last year, the airport also saw an average of three takeoffs or landings per day by big jets unconnected with Boeing, mostly those undergoing maintenance at the ATS repair and modification facility. However, 96 percent of the flight operations out of Paine Field are by small private aircraft. The airport said these planes averaged 282 operations per day in 2016, counting not only landings and takeoffs but repeated touch-and-go pilot-training maneuvers, each equivalent to a landing and a takeoff. In a sign of things to come, Alaska landed one of its Horizon Air regional jets, an Embraer 175, at Paine Field for the Monday ceremony.